Welcome to the May 2015 issue of the Washington Rural Health Association e-Newsletter. Spring is a time of renewed energy and a time to refocus our efforts for the future. Inside this issue you will find news and information from the new 2015-2016 president and board of directors, members, and community partners from across the state of Washington. The May issue is generally the issue where each newly elected WRHA President is introduced and discusses the initiatives for the upcoming year. Well, this edition is no exception. However, before I start, I first want to thank the conference planning committees from both the NW Critical Access Hospital and the NW Regional Rural Health Conferences for a job well done. These committees were chaired by Kim Kelley and Bonnie Burlingham, both from the Washington State Department of Health. On behalf of the Board and the members of WRHA, thank you to the Chairs, their committee members, and the many organizations that contributed to the success of this annual event. At this meeting we hold our annual WRHA member meeting to nominate and elect board members, and we hold one of our face-to-face WRHA Board meetings to appoint officers and discuss our initiatives for the upcoming year. Our new officers for the year are: Jeffrey Johnson, CPA, appointed as President; Tim O’Connell, to continue as Treasurer; Sandy Brecker, appointed as Secretary; and Jon Smiley as Past President. The President Elect position is still open. A list of the officers and board members, including their email addresses, can be found on the WRHA website at www.wrha.com/board-of-directors. Continue to serve as a strong advocate for rural healthcare across the continuum of care. Work to promote a better understanding of rural health issues in Washington and work toward identifying solutions to improve regulatory and financing policies affecting the delivery of care in rural areas. Provider opportunities for education and training for those that work in rural healthcare. 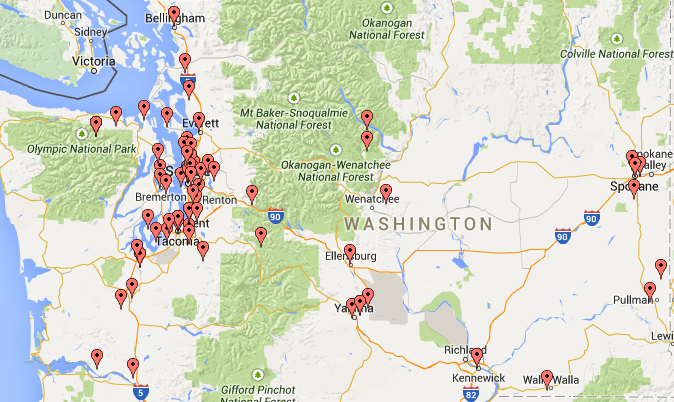 Support other organizations in their efforts to improve health care delivery in rural Washington. One way the Board believes we can accomplish this is by hiring an Executive Director to manage the operations of WRHA. Too often great ideas are presented and agreed upon to shape the delivery of rural health care but fall to the wayside due to limited resources, mostly time of volunteers that are already stretched to capacity. We believe that if we can direct our resources to a specific individual to execute on the WRHA’s initiatives, it will begin to thrive with the renewed energy it once had during its formative years when it was founded back in 1988. Over the coming months we intend to meet regularly, and with a renewed sense of meaning. Our first major initiative is to recruit and hire an Executive Director. As this task unfolds, we will communicate to WRHA members on a regular basis through our website with updates on where we are in the process. 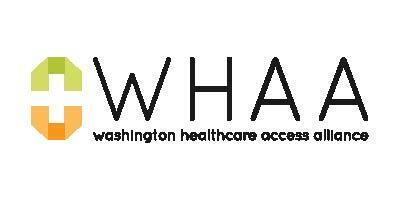 Concurrently, we will be solidifying our WRHA strategic plan that will serve as a playbook for our new, yet to be determined, Executive Director to utilize in executing how to best advocate for the future of rural healthcare in Washington. Finally, please let us know of your interest in helping to make WRHA a thriving organization for the advocacy of rural healthcare in Washington. As the old saying goes, “many hands make for light work” is crucial for our organization to be successful. Please visit the Committees’ page of our website at http://www.wrha.com/committees if you are interested in serving in some capacity on a committee. I look forward to serving as your President during this 2015/2016 year! Jeffrey M. Johnson, CPA, is relatively new to Washington, but not new to rural healthcare. 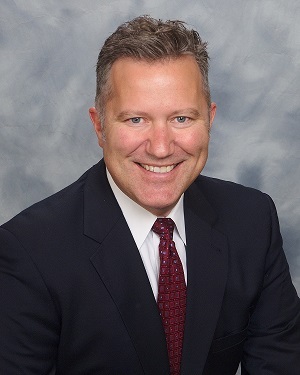 Jeff is a partner in the Spokane office of Wipfli LLP, a CPA and consulting firm. Jeff moved to Spokane in August 2012 from the Minneapolis office to lead the Northwest region’s health care practice following the retirement of Michael R. Bell, CPA. Jeff has spent nearly his entire 25 year career in healthcare working at the Mayo Health System for five years and the past 20 years at Wipfli LLP, primarily working with rural healthcare providers. He is a frequent speaker at national and regional healthcare industry conferences. Jeff is from a small town in Iowa and a graduate from Iowa State University. He is married to his wife, Laura of 25 years, and has five children. Jeff likes the outdoors and enjoys spending time with his family. Colville, WA – Providence Mount Carmel Hospital Foundation presented the Stevens County Ambulance Service with a check for $53,569.10 during a ceremony at the hospital on March 11. Money raised by the Mount Carmel Hospital Foundation will purchase two defibrillators for the ambulance service. “Stevens County Ambulance Service is often the only lifeline between our residents and emergency services at times when minutes count and emergency health care is needed,” said Ron Rehn, chief executive of Providence Health Care Stevens County, which includes NorthEast Washington Medical Group, Mount Carmel Hospital, St. Joseph’s Hospital and DominiCare. “These new defibrillators mean lifesaving services will be readily available for our family, friends and neighbors in Stevens County” he adds. Stevens County Ambulance Service is a voluntary service operated by the Stevens County Sheriff’s Department, serving northern Stevens and northern Ferry counties, with a population of 25,000 dispersed over 2,000 square miles. It serves as an emergency transport system for patients needing emergency care at Providence Mount Carmel Hospital in Colville and St. Joseph’s Hospital in Chewelah. The donation to the ambulance service is one of the last official gifts by the Providence Mount Carmel Hospital Foundation. Beginning next month, the foundation will join forces with the Providence Health Care Foundation Eastern Washington, and its members will work together to support programs, services, education and equipment that impacts and saves lives in Stevens and Spokane counties. The change comes at a time when the average age of foundation board members is over 60. "This transition will help us continue to raise funds for Mount Carmel and serve the health care needs of our communities,” says Mary Selecky, president of the Mount Carmel Hospital Foundation and former Washington State Secretary of Health. “Our foundation will continue as part of the Providence Health Care Foundation, and our community will continue to support the types of investments that help bring needed services to residents of our county,” she says. “The contribution to the Stevens County Ambulance Service is just one example of the many times Colville residents have raised money to improve health care. In recent years, the foundation raised local funds to help build a new state of the art hospital in Colville,” adds Selecky. “We also raised funds to make sure we have digital mammography right here in town rather than depending on services in Spokane," she says. Phil Stalp of Colville will join the Providence Health Care Foundation serving Stevens and Spokane counties. For more information about the PHC Foundation, go to PHC.org, or call (509) 474-4917. The Airbus H135 helicopter includes the next generation of avionics and enhanced situational awareness for pilots. 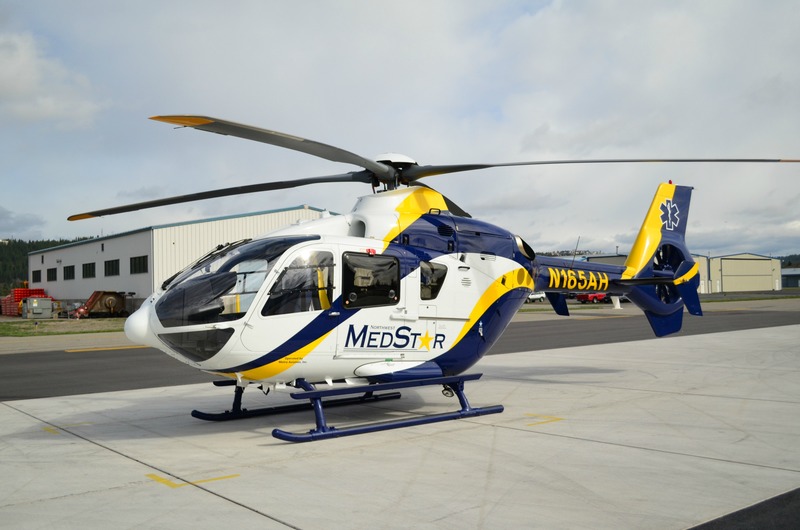 Northwest MedStar purchased the helicopter and had it modified for air medical services. The aircraft provides services throughout the Inland Northwest. 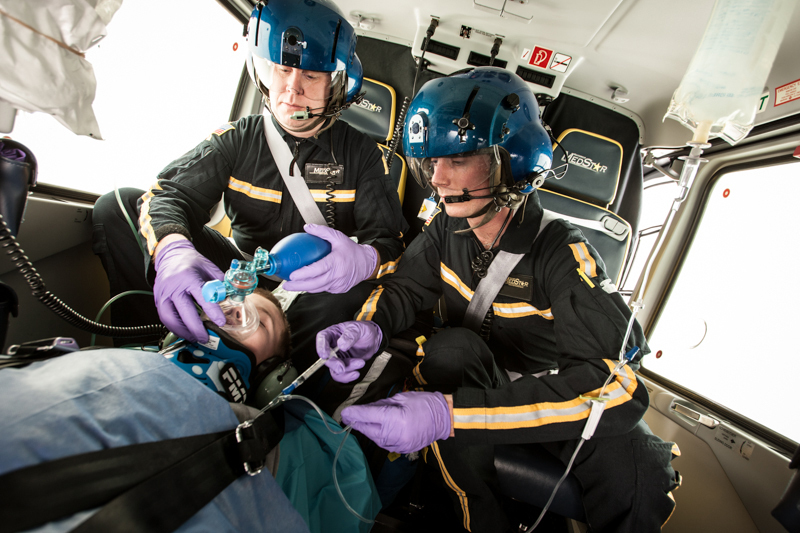 Northwest MedStar’s fleet is comprised of eight helicopters, five airplanes and eight critical care ground units located at six base locations including Missoula, Mont., Spokane, Moses Lake, Brewster, Tri-Cities and Palouse region. Shriners Hospitals for Children – Spokane always places patient safety first. Infection control is a large part of this effort and a major part of infection control is preventing surgical site infections (SSI). The full laboratory services on site at the Spokane Shriners Hospital are the front line of defense for the children that we treat. They work hand in hand with the clinical staff and with our recreation therapists to ensure patients are as safe and as comfortable as possible. Our lab protects our kids by prescreening patients before surgery. It provides a variety of tests, catering specifically to our pediatric patient population. One of the top SSIs is MRSA (Methicillin Resistant Staphylococcus Aureus). A child can be a carrier of MRSA without knowing it. If they are a carrier, our patient needs to be treated by a process known as decolonization. In the past, a patient would be tested for MRSA and await the results of the test for up to two days (an industry standard) before knowing if treatment for bacteria was required. The Spokane Shriners Hospital, in its dedication to patient safety, has made an effort to improve on this “status quo.” It has been able to purchase a new analyzer that brings MRSA screening to a higher level. This instrument returns results in as little as one hour. Not only is the testing turnaround time drastically improved, but it also gives higher quality results. 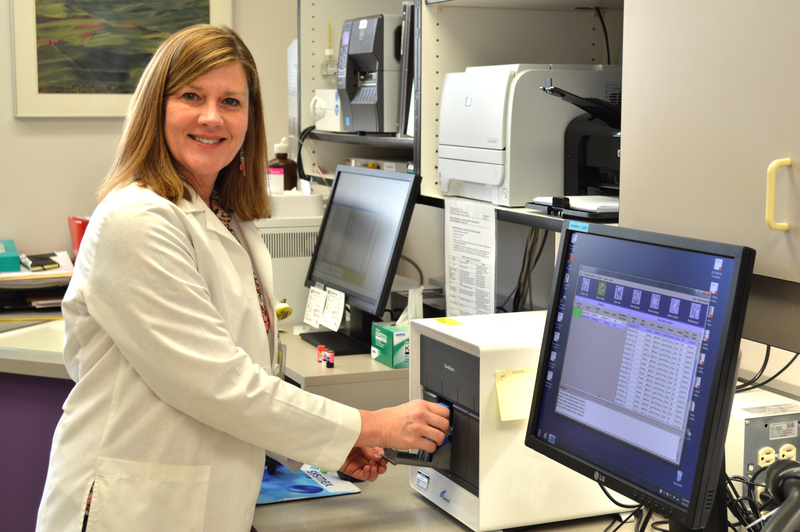 Once the lab technologist verifies the results in the lab software, the results are uploaded into the electronic medical record, which the clinical staff can see from anywhere in the hospital with the click of a button. 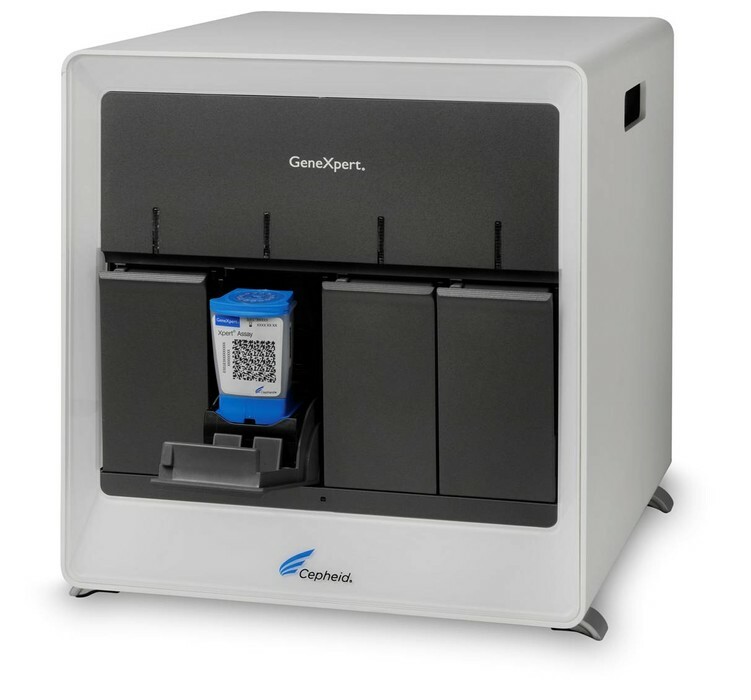 As the manufacturer states, the GeneXpert IV by Cepheid, is a “fully integrated and automated on-demand molecular diagnostic system.” This means that the GeneXpert is fully self-contained, performing all the stages of the multi-step process within one unit, providing our medical staff with the highest level of confidence in the results. It tests at the genetic level, searching specifically for the MRSA genes, which gives higher quality results than ever before. At Shriners Hospitals for Children – Spokane, every decision, every purchase is made with consideration of this: will this help us give better care to our kids? When it comes to preventing infection, that answer will always be yes. Accreditation assesses the quality of the program and the programs and services offered. Students are assured that the program meets or exceeds the standards set by accreditation. The two-year accreditation process allows students and staff to train under a “Letter of Review” while taking the steps necessary to meet the standards set by the CAAHEP. 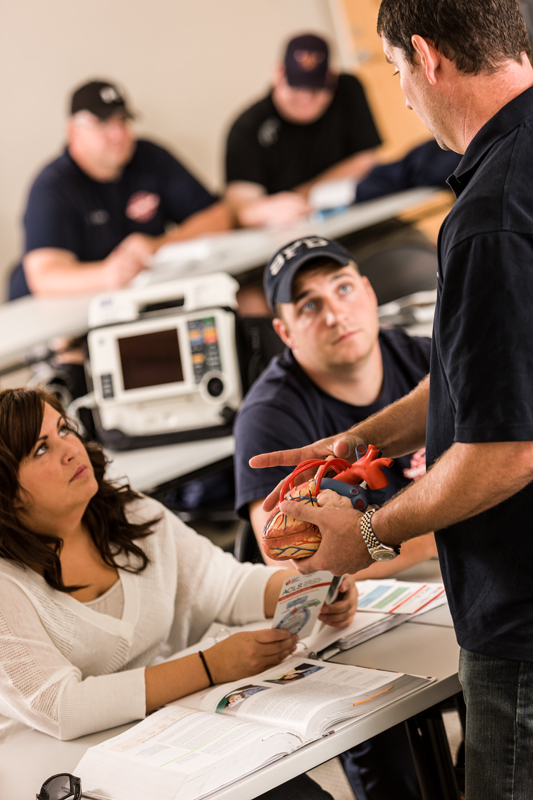 Since first offering the program in 2012, INHS Health Training has held four Paramedic Program classes with 55 students. Students that elect to take the National Registry Test (NREMT-P) have a 100 percent pass rate, demonstrating the caliber of the INHS program. To learn more about the program, please visit: https://healthtraining.inhs.org/. The topic of this month’s “Top Ten Revenue Cycle Opportunities” pertains to common reasons for hospitals to annually review their charge description master (CDM). Whether you are simply updating annual CPT code changes or conducting a full CDM review, expect to find issues that show you’ve been leaving money on the table. Wipfli has identified a list of common CDM review findings, many of which relate to missing or incorrect reimbursements. Is your CDM reviewed and updated annually? This is probably the single most important process for keeping your CDM finely tuned. In this annual review, your CPT and HCPCS codes should be reviewed for deletions, additions, and revisions based on the AMA’s yearly updates of the CPT coding system. It is also a good time to deactivate items with no usage that are no longer needed and services that are no longer performed. This may require working with each department manager as they plan for the upcoming year. Do department managers have a copy or access to the portion of the CDM pertaining to their department? It is wise to involve each manager in the care and maintenance of their CDM. The manager is the best person to know the specific services currently provided and those that are planned in the near future. Are changes made in the CDM upon discovering failed claim and denial issues? By studying claim edits and denial trends, you can resolve issues at their source. If an incorrect revenue or CPT code is the issue, then it is worth taking a look at that item in the CDM file to determine if it is set up correctly. Have the procedures in the CDM been compared to the charge tickets/screens for completeness and accuracy? We guarantee there will be errors found here. We often find incorrect CDM numbers, missing services, and outdated CPT codes all lurking within the charging systems! Is there a cross-functional CDM team actively functioning in your hospital? 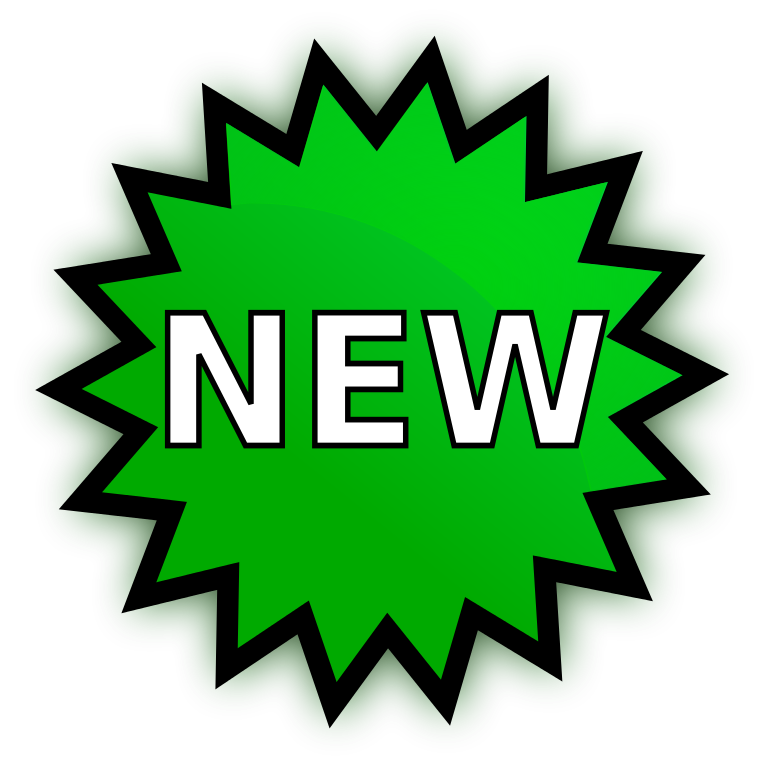 Does it meet regularly and monitor additions, changes, and deletions to the CDM? Does someone circulate important CMS updates to the appropriate managers? This team can make sure your CDM Coordinator has the guidance and support needed to keep the CDM file up to date. Is your CDM compliant with Medicare’s required reporting guidelines? Are your HCPCS codes complete and correct for pharmacy, OR supplies, etc.? Although detailed coding is not required for most critical access hospital (CAH) claims, any CPT/HCPCS codes that are reported must be valid and applicable to the item/service rendered. Are there bedside procedures that are performed by nurses or physicians that are not being charged? A review of your documentation and the CDM will help to identify missing services and can add potential revenue that is currently being missed. For Method II CAHs – Is your hospital charging a professional and technical fee for all services where appropriate? In many CAH CDM reviews, we discover that only the professional fee for the service is being captured. It is important to ensure that all procedures have professional and technical components built into the CDM so that your hospital’s charges accurately reflect all services rendered. It will also ensure that accurate payments are made for all procedures. Are charge capture audits being performed regularly? By comparing claims to documentation, you will likely identify missing items from the CDM, items that have incorrect revenue codes, drugs with incorrect unit configurations, or departments with charge capture issues. Every hospital should be regularly conducting such reviews to monitor billing and compliance. Is your hospital meeting its compliance requirements? By having an independent review organization perform a CDM/charge capture audit, you will demonstrate to Medicare and other payers your hospital’s proactive intentions to maintain an accurate CDM and billing process. Should a Medicare RAC, MAC, or other payer conduct claim auditing, your hospital’s chances for CDM-based errors will be significantly reduced. Wipfli’s national health care practice has nearly 100 associates dedicated to serving more than 1,800 clients in 45 states, including integrated delivery systems, large community hospitals, critical access and rural hospitals, physician practices, and senior living organizations. Wipfli can advise in all areas of business, from finance and operations to human resources, information technology, and reimbursement. For more information, visit www.wipfli.com/healthcare. In its report entitled “What’s at Stake,” the Washington State Office of the Insurance Commissioner identified 1,090,000 residents as uninsured prior to 2014. As of the end of 2014, the Washington Health Benefit Exchange stated that the number of uninsured has been reduced by 30%, leaving more than 750,000 people still without insurance. Free clinics have long been an important part of the healthcare safety net in Washington State. And with so many people still uninsured, the need for free clinic care remains significant. Compared to many states, Washington’s implementation of the Affordable Care Act (ACA) has been very successful, particularly in regard to Medicaid enrollment. Unfortunately, coverage does not equal access. Free clinics across the state actively assisted Medicaid enrollment efforts. After a dip in free clinic patient visits at the beginning of 2014, most clinics are now seeing a return of patients they helped enroll. Washington’s enrollment of patients into subsidized insurance plans under the Affordable Care Act has been less successful. Information provided by the Washington Health Benefit Exchange indicates that enrollment in these plans peaked at 149,000 in May 2014, and was 107,000 by the end of December. With over 27,000 of those covered at the end of December being new enrollees, 47% of patients enrolled at the peak have dropped their coverage. Individuals with partial subsidies and catastrophic plans are finding it difficult to afford copays and deductibles. Many Apple Health patients are challenged to find Medicaid providers. With decreasing reimbursement rates and a statewide healthcare provider shortage, particularly in rural communities, this is unlikely to improve. Still others are completely excluded from eligibility for Medicaid despite income, including undocumented workers and legal immigrants in the US fewer than five years. Since the beginning of 2014, the role of free clinics has been confused in the media, with many misrepresentative stories about large numbers of free clinics closing due to lack of demand in a post-ACA healthcare environment. The October 2014 Seattle/King County Clinic, organized by the Seattle Center, provided a clear demonstration of healthcare need. The Seattle/King County Clinic took place over a four-day period at KeyArena. Over 1,400 volunteers served 3,400 patients from 230 zip codes with medical, dental and vision services. Patients waited all night for care, but despite the extraordinary capacity of the event, many were turned away, including patients who had traveled to Seattle from rural Washington. Washington is likely to have a large number of uninsured patients into the future. Newly covered patients have brought the total rate of uninsured down to approximate 2008 levels. Free clinics remain a vital part of the healthcare safety net and a critical resource for our many underserved communities. Residency training programs offered through the Spokane Teaching Health Center allow recent medical school graduates to continue their education here in the Inland Empire. These tracks are valuable for our region, according to Gary Newkirk, M.D., program director of Family Medicine Residency Spokane, because there’s a clear link between the geographic location where medical graduates complete specialty training and where they eventually stay to practice. This training model is a win-win for patients and doctors alike. Practicing in a rural community affords closer relationships between new physicians and their patients and often leads to a long-term commitment from residents who decide to stay after their training is complete. Maureen “Mo” Campbell, M.D., currently a second-year resident physician in the rural training track, says she’s loving the experience in Colville, Wash. “You feel like you’re part of the community on a personal level,” she says. The Colville medical community established the first Family Practice Rural Training Track site in the United States in 1986. 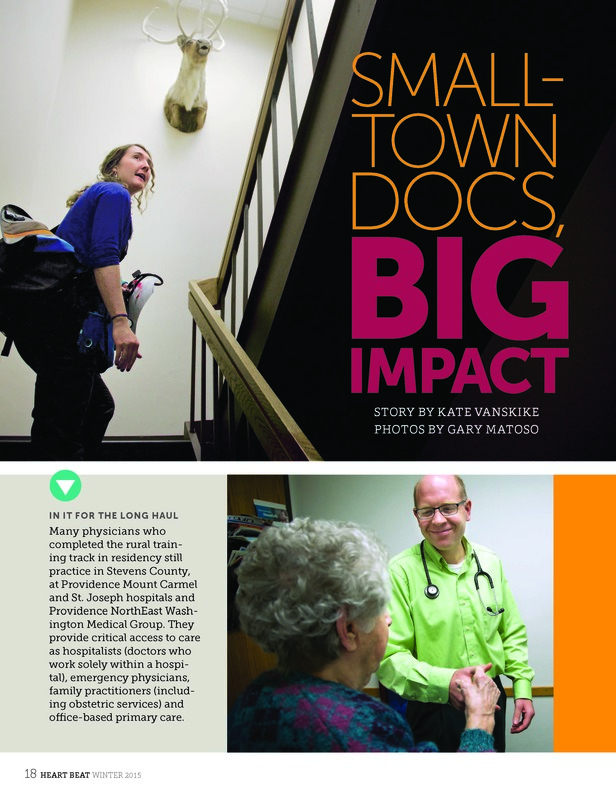 The founding practice, Providence NorthEast Washington Medical Group, serves three counties in rural northeastern Washington. Faculty for the training program includes 11 family practitioners: five internal medicine physicians (including a board-certified gastroenterologist, a noninvasive cardiologist and a pulmonologist) as well as radiology, surgery, urology and podiatry providers. They serve with Providence Mount Carmel Hospital, which has been recognized by state and national associations for its excellence as a critical access hospital. “We couldn’t be more proud that our program has become the national model and standard for rural community-based graduate medical education,” says Dr. Ball. Empire Health Foundation, a private grant-making organization in Spokane, ran its first Rural Aging Responsive Grant Cycle in early 2015. As part of its newly established Rural Aging Services Initiative, the Foundation made grants to seventeen organizations in Adams, Ferry, Lincoln, Pend Oreille, Stevens, and Whitman Counties to support a wide range of one-time projects to support rural seniors to live full, meaningful lives with independence and dignity. Foundation staff performed outreach and made small grants to organizations in the six counties throughout 2013, the first year of the three-year initiative, which helped establish connections and build relationships with a range of aging service providers and nonprofits in the rural counties. Community meetings, interviews with rural seniors, and conversations with community leaders helped us develop an understanding of the wonderful work being done to support rural seniors (often spearheaded by seniors themselves). Several grants were made to senior centers in Adams, Stevens, Ferry and Pend Oreille Counties for various projects, including installing safer parking and improved building access for individuals with disabilities, support for meal services, and programmatic funding. A couple of organizations obtained funding to provide Stay Active and Independent for Life exercise classes, and the Foundation was also delighted to be able to support the Healthy Living with Chronic Conditions Workshops offered by Rural Resources Community Action in the Tri-Counties. A handful of grants were awarded to support intergenerational engagement opportunities as well. One of these grants went to support the Washington Rural Heritage oral history and photo digitization project in Whitman County, and another went to implement a variation on the Music and Memory project led by the Community Band of the Palouse. One of the most uniquely rural requests we received was from the South Pend Oreille Fire and Rescue Auxiliary for funding to install reflective blue address signs for seniors in remote homes. Looking to reduce the average response time for the local emergency medical services division, the project includes funding for 120 high visibility address signs that will save EMS teams valuable minutes driving by hidden homes on back roads at night. The project also includes assistive device installation for bathrooms, showers, and the like, which will hopefully result in fewer EMS calls altogether. Empire Health Foundation will run two more Rural Aging Responsive Grant Cycles in 2016. Please email [email protected] if you would like to be added to the announcement list.